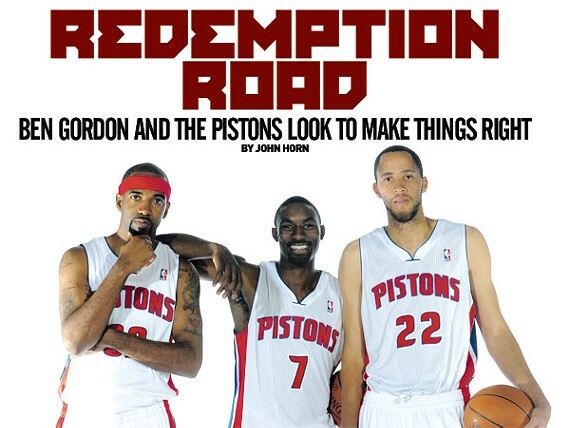 For Detroit Pistons fans and players, the best thing to come out of last season was its end. Detroit finished with a 27-55 record amid plenty of empty seats at The Palace on game nights. The Pistons quickly, and quietly, dropped out of a lot of people’s conversations long before season’s end. The hangover of a 55-loss NBA season is tough to cure. A year like that exposed a Pistons team that was weak in pretty much every area — scoring, defense, team chemistry and keeping the right players in the right positions from one game to the next. Coach John Kuester had to Frankenstein together a lineup seemingly every other night. As they ready for the 2010-11 campaign, Detroit’s players and top brass agree that redemption starts with chemistry and keeping players healthy. “First and foremost, guys can never control injuries,” says Piston guard Ben Gordon. “One of my main hopes is that everyone stays injury free. You know, I think that was half of the problem right there. Gordon’s season last year crystallizes that very concept. Gordon, a dynamic shooter who came to Detroit from Chicago via free agency in 2009, started last season in a furious style. He averaged 24 points per night in the first nine games, including 30 in a loss to Toronto in late November and another 29 points four games later in a win over Washington. A right ankle injury landed him on the injured list after that scoring frenzy and his production never recuperated. Gordon would miss 11 games with the ankle and, later, another eight with a strained groin. And despite dropping a team- and season-high 39 points against Miami near season’s end, he averaged less than 10 points per game from December through March. Injuries raided the Pistons’ roster of any chemistry. Guard Rip Hamilton missed 36 games with a sprained right ankle/sore hamstring medley. Forward Tayshaun Prince was lost for 32 games with back problems and a sore left knee. Ben Wallace missed 11 games with bad knees. And already this year, second-round draft pick Terrico White, a fierce dunker, is out with a broken foot. Starting forward Jonas Jerebko is out five months after blowing out his right Achilles. Both had surgery recently. It’s impossible to establish and sustain cohesion when the core of the team is not playing together consistently. “With the number of injuries suffered last year, we never really got to see what type of team we had because our coaching staff had to mix and match lineups for a majority of the season,” says Joe Dumars, the team’s president of basketball operations. Dumars improved the team’s chances with a solid NBA draft this year, taking 6’11” center Greg Monroe with the seventh overall pick, and White in the second round. In Monroe, Detroit gets a big man with uncanny passing skill. Dumars also signed veteran free agent guard/forward Tracy McGrady this off-season. McGrady, 31, is a seven-time All-Star but has battled injuries in recent years and is coming off major knee surgery in 2009. The move may or may not pay off. Still, for Gordon, team health and chemistry will be critical if the Pistons plan on making a ruckus in the Eastern Conference. The Central Division alone will be difficult to navigate. Teams like the Bulls have improved on an already solid nucleus. An off-season of rehabbing has given Gordon some time to drink in his new-ish surroundings. “Michigan is great, it has great weather,” he says. You know what else our great state has? Thirteen percent unemployment right now, down from the 20 percent that choked the region and the state last year. A lot of Real Detroit Weekly readers are on tight budgets. With an average ticket somewhere around $30-$35 each, plus $10-$20 to park, what incentive does a fan have to come out after what happened last year? Dumars says that despite the tough economic times around here, he expects the Pistons to do what’s right on the court. He hopes fans respond. Fighting and scrapping? Not sure if it gets much more Detroit than that. Published previously by Real Detroit Weekly Magazine. Photo courtesy of the Detroit Pistons.